Securing loans can be a stressful, frustrating, and even overwhelming process. Most of us aren’t financial experts, so deciphering money data is often the last task we want to approach. Still, loans can affect future decisions and possibilities. That’s why it’s essential to make sure you’re getting the best deal possible. In this article, you’ll learn what loan methods to avoid, as well as options you might not have previously considered. Knowing this information will empower you to make sound financial decisions to protect you and your family. When you’re in need of a loan, it’s difficult to keep all your options open. However, some lenders don’t have your best interests at heart. They’re only interested in closing your deal so they can move on to the next. Just as you wouldn’t buy the first house or car you see, it’s important to compare and contrast potential choices and arrive at a decision that best meets your unique requirements. For example, vehicle title loans are an excellent way to quickly get the cash you need. When you bring in your vehicle in good working order with a clean title in your name, you can be on your way toward financial freedom in no time. Many people wonder why lenders always ask for so much personal information. Financial experts admit they often don’t really need all this data. In addition, some unscrupulous firms collect facts and figures on their customers for their own gain, including promotion, advertising budgets, and more. By contrast, when you secure a reliable vehicle title loan, you won’t get the third degree. Instead, you’ll get the best possible deal for your vehicle in good working order with a clean title in your name. At Auto Pawn, we stand by our assertion: no pressure, no secrets, just transparent great deals. There’s nothing more frustrating than trying to work with a lender who only offers a few rigid options. Their loans are either too small or require you to borrow large sums. No one has the time or patience for that kind of game. 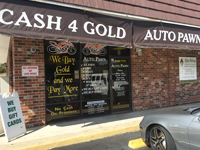 One of the main reasons why more people are turning to Auto Pawn is because of the simple and straight-forward process. Since your deal is based on the clean title vehicle you bring in, you’ll never be forced or pressured into high risk loan terms. That’s part of the reason why we’ve quickly earned a reputation as the best DeLand pawn shop. Despite what you might have heard, having a perfect credit score doesn’t necessarily open doors. While good credit works for some deals, there are many other avenues to reach your financial goals. For example, we pay more cash for gold than other Central Florida pawn shops. That means you might be wearing or storing valuable items that you could turn into cash today. Even with the recent push toward online and paperless transactions, the fact remains that cash is still king. No amount of credit can match the value of money in hand. As mentioned, loans aren’t only available at the bank. Instead, there are many selections available to you. That includes safe and convenient vehicle title loans. Simply bring in your vehicle in good working order with a clean title in your name, and one of our friendly and knowledgeable team members will begin working with you right away to secure the best possible deal. In addition, we offer cash for gift cards and gold. Since we deal directly with the refinery, we’re interested in your coins, jewelry, and other items in any condition. New, antique, or broken, our deals are simple and straight-forward. 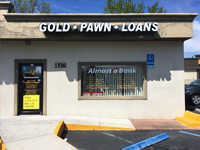 Plus, with three locations in Volusia County, your nearest pawn shop is closer than you think. Contact us today to learn more about how we can help you get the most for your money. Or, simply drop by one of our easy access locations. 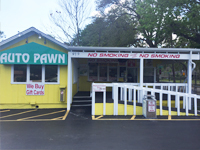 How Does Auto Pawn Work? Do You Need a Pawn Loan? Cash in 5 minutes. No Credit Check Needed. Get CASH Today! We pawn cars, boats, motorcycles, dump trucks and more. We will pawn almost anything, up to $100,000! Copyright © 2019 Auto Pawn of Daytona. All Rights Reserved.